KID MYSTERY MOVIE SEEKS NEW STARS … MAYBE JUST LIKE YOU! KNOX CHASE ON THE CASE OF THE VALENTINE’S DAY MYSTERY, based on the new book by Adam Lipsius, will begin filming a feature film version this Summer. The producers of the movie have launched a nationwide, online casting contest. They promise to hire 1 boy, 1 girl and 1 adult to be in the movie, guaranteed. These winners of the contest will be flown to set, put up in a luxury hotel, transported to and from location and filmed in a scene. Those are the rules: 3 winners will receive named parts in Knox Chase on the Case and travel to be in the movie. But the producers are really hoping to find one or more of the lead actors for this brand new movie. They want everyone to get a chance and hopefully be discovered. 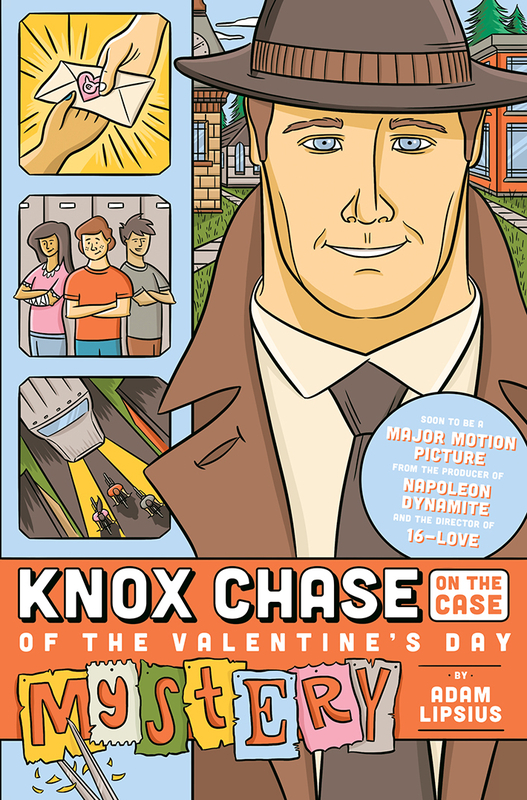 “Knox Chase on the Case of the Valentine’s Day Mystery” is being produced in consultation with Sean Covel (Producer of Napoleon Dynamite) and the Casting Director is Mary Jo Slater (the casting director of Dumb and Dumber, the Contender and ABC’s Perception). This production has real film makers involved, and the producers believe this is a great chance for aspiring child actors to be discovered. Download the script. All the character breakdowns are listed below. If you’re a boy, you can try out for KC Green or Benjy Young. If you’re a girl, you can try out for Cat A Liszt. And if you’re a grown-up, you can try out for Knox Chase or Mary Green. There are over a dozen roles we want to cast, so don’t worry if you don’t think you’re right for any of these parts. If the producers think you’d be better for another role, they will send you that script to audition for in a call-back. Record your audition. Don’t get too fancy. Prop your cell against a wall or ask a friend to hold the phone while she or he reads with you and then return the favor when it’s their turn. Upload your audition video to YouTube or Vimeo, and then share the link with the contest as you’re registering. That’s it! Your chance to be in a major new movie, and it only takes a few minutes to enter. Once you’ve uploaded your video, you should get your friends and family to vote for your video. They can all vote once per day, and all videos that get 50 votes or more reach the final round of judging. The contest ends on March 26th, so you should get started. Today. Right now! And while you’re thinking about, here’s a little more about Knox Chase on the Case of the Valentine’s Day Mystery. SYNOPSIS: KC Green is a small-town kid with a big-time imagination — and an even bigger secret. He can see the pulp fiction detective he was named for from the 1930s & 40s Knox Chase on the Case novels, and no one else can. This old school gumshoe lands our hero into tons of small-time trouble, but when a mysterious stranger bumps into KC on Valentine’s Day, a crime wave hits town. Someone is trying to steal a fortune, and they’ll hurt anyone who gets in the way. It takes all of KC’s wits, his invisible partner, and his best friends, Cat & Ben, just to stay alive in the Case of the Valentine’s Day Mystery. If you want to learn even more, there’s a 25% discount off copies of the book on Amazon when you visit knoxchasemovie.com! KC Green– (Caucasian or other ethnicity) He’s a small town kid with a big time imagination. He doesn’t want to get caught talking to a pulp fiction detective that no one else can see, and he has a major crush on Cat. Cat A Liszt– (Hispanic or other ethnicity) She’s the prettiest, smartest girl in her class with no idea how amazing everyone else thinks she is. She’s also an piano playing prodigy with a beautiful voice. Benjy Young– (Asian or other ethnicity) He’s KC’s best friend and is convinced that his buddy is losing his marbles. Benjy’s skeptical sense of humor and annoying habit of telling the truth are about the only things that keep KC on his toes. Knox Chase– (Caucasian or other ethnicity) He’s an old-fashioned private eye trapped in our bland future, playing side kick to a tween. Needless to say, anyone would seem like a better partner to him. Mary Green– (Caucasian or other ethnicity) KC’s mom is essentially raising her son alone while her FBI husband is off trying to solve the same case that’s kept him away for three years. She perseveres with all the humor and courage she can muster, but some days it seems like too much to bear. Thank you so much for thinking about this, BUT STOP THINKING and try out already! It may just be the best thing you’ve ever done.